Welcome to the CoE Weekly Update for the week of July 25th! This week's update is relatively short as a lot of the fun-stuff we've been working on was shared throughout the week. Honestly, I'm not sure if that's good or bad. In any case, we'll share it again here for those that don't regularly visit the forums or IRC. Also, I wanted to begin this week's update by sharing a crazy experience that I had mid-week. In truth, it's extremely relevant, and should be obvious why from part of the update. So, earlier this week the team and I decided to go out to lunch with a friend of one of the employees. That's not uncommon, but what was uncommon is about a third of the way through the meal a man at a nearby table called out to me and started providing his insight on the conversation we were having. He seemed nice enough, so I responded, and the gentleman and I struck up a conversation. We started talking about telecommunications, technology, video games, etc. At some point, the conversation naturally turned toward Chronicles of Elyria. Here is where I did my usual thing of forgetting all about where I was, who I was talking to, or what I was doing, and I began raving about all the game's features, the new business model we're introducing and so much more. I explained why we wanted to use the business model we did, how it benefited our players over existing MMORPG business models, and how we were going to change the industry. After maybe 45 minutes of this, the conversation began to wind down and I realized that I'd been sitting at a table with my employees for the entire lunchtime, while simultaneously turned aside talking to a gentleman that had now come and sat down next to me so we could have a conversation with shouting. It was around this point that I realized I didn't even know his name, or what his business was. So naturally I asked. I was floored. While I won't share the information here, what I will say is the gentleman I was talking to has had a distinguished career, including being Vice President for a Fortune 100 company, and had worked side-by-side with some of the greatest minds of our age. He must have known what I had just realized, but instead of making a fuss, he simply offered his business card to me and asked for mine. He told me, good businessmen are made up of two things: passion, and virtue. Put differently, he explained the most successful men he knew achieved their success due to two things: A love of their product, and a love of their customers. He wanted to know my name because he believed I possessed both, and Soulbound Studios was going to go places. He was right. While I can't claim to have a monopoly on the idea, what I can say unequivocally, is that I love my game, and I love our players. With that, let's get into the update. One of the ways we show the players how much we appreciate them is by listening to them. I mean really listening. 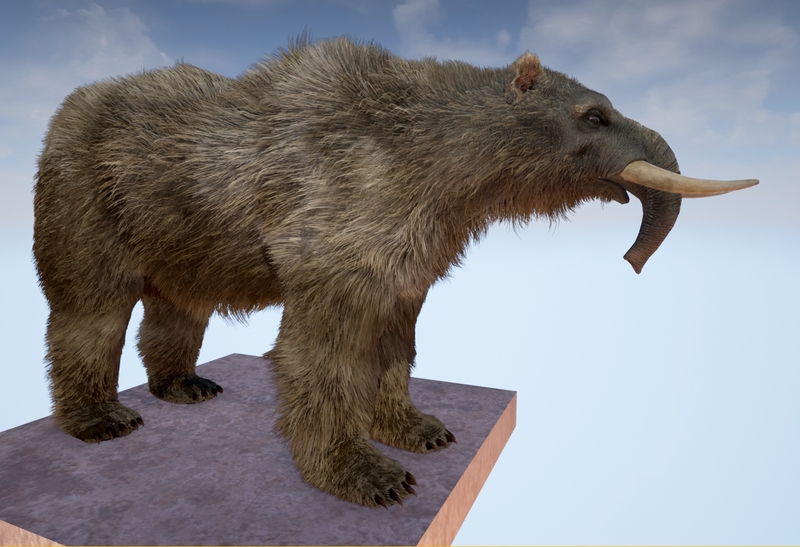 Earlier this week we posted the first screenshot of the Ursaphant, which you can see here. Now, it's not bad, but let's compare it with the two concept pieces we'd shown previously of the Ursaphant. After a closer look at the concept, it's obvious there's a few discrepancies. One of the things we pride ourselves in is being true to our word. That, to us, includes concept art. Historically, we've been really good about getting our characters, creatures, and environments to look as close as possible to our concept art. But in looking at the Ursaphant it's clear there's some differences. So when we showed people the Ursaphant earlier this week there was naturally some concern, some voiced opinions, and even some well-constructed feedback. We love it when that happens. When we get constructive feedback it gives us something to work off of. So, with the feedback in hand, I had our character artist revisit the Ursaphant to make a few alterations to bring it closer in line with the original concept art. Here were the modifications that were made. And shown here is the final result. As you can see, it's much closer to our original concept, and it shows what happens when the players and developers work together. This week in Production was... productive. First, we made the final arrangements and our new Web/UI Developer begins tomorrow, August 1st. He has a pretty impressive resume and joins us from another MMO company, where he was their Lead Web Developer. We're extremely excited to have him joining us and look forward to the work he'll be doing on the website, as well as on the game. Next, we pushed out version 2.0.8 of the website, which included many improvements and bug fixes and makes the mobile version of the website almost usable now. We've just got a couple more hot-fixes and then we'll be re-focusing our attention on features - including the store. In addition, we've got a new video which we'll be sharing out this week to people who have a Max Influence of 3,500 or higher. The video will be linked from our new exclusive Early Access Forum, which was advertised as a Kickstarter reward at the $350 Tier and above, and grants those with Alpha 1 access exclusive Early Access to game content and footage. This first video, which has already been shared on IRC with people who came in with 3,500 Influence or higher is nothing special. It's 5 minutes of the character walking around New Haven. The video was originally shot to capture screenshots, and was taken back at the beginning of July when Raevantiel came into the office. However, he was missing animations and the latest binaries so the video wasn't acceptable for broad release. In spite of that, we're sharing it with our Alpha 1 backers and so far, the feedback has been quite positive. For those that aren't at that 3,500 Max IP Level but want to be, don't worry. Once the store opens you can upgrade your pledge, and the video will still be available in the exclusive Early Access Forum. Finally, and perhaps most significantly, we got our open positions posted up on LinkedIn and have already received emails from several promising candidates. If you'd like to check out our open positions click the links below. This week we'll be working to get our open positions posted to our own website, as well as several other job websites. Hopefully it won't be long before we've grown to a full team of 25 people. This was a super productive week in design. Unfortunately, it's too early to talk much about it. This week myself and the other designers have been re-visiting character creation, max-lifetimes, and even marriage. We'll have more information for you in an upcoming update. Well, that's all for this week. And in an effort to stick to my promise of talking only about what we have been doing, not what we will be doing, I'll avoid telling you what we're working on in the immediate future. However, stay tuned in August as we should have some really good updates coming your way. Keep up the awesome work guys! Can't wait to see what you guys have to show us next. this it going to be good! Thx you i am very interested in the game! So, Is the Ursaphant going to be a mount and will it attack with you? Like a pet? Great job with the mount guys! You're sending a great message to the community. Keep up the good work! The mount is looking really cool I am liking the revised version even more! 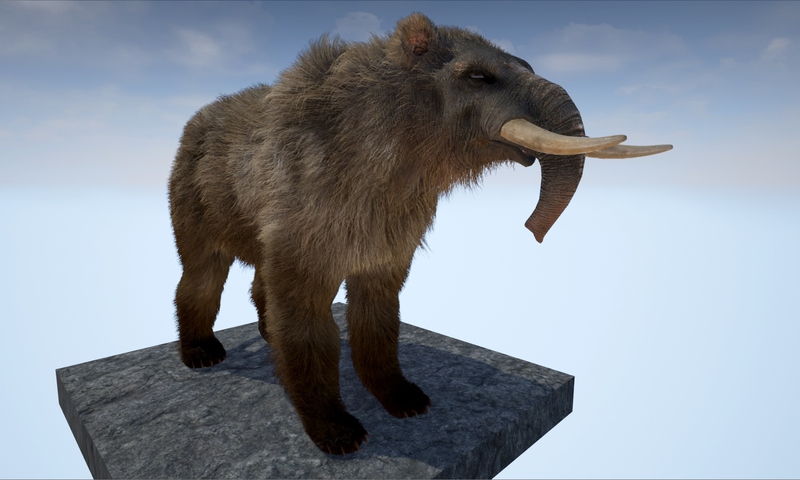 Question...Will the Ursaphant in the northern snowy parts of the continents have white fur as opposed to the present Usraphant who has the features of a temperate zone mammal? It is crazy how much discussion there can be on just one animal! Just shows how vast CoE is that we can talk so much about it. 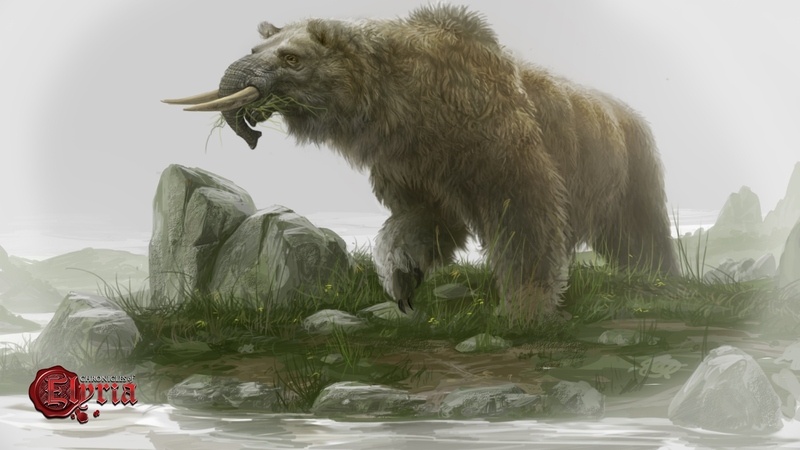 Posted By **Ottley** at 4:04 PM - Thu Aug 04 2016 > > Question...Will the Ursaphant in the northern snowy parts of the continents have white fur as opposed to the present Usraphant who has the features of a temperate zone mammal? I sure hope so, It would be so cool to see their fur colors change as it gets warmer. It may be hard to do, so we will have to wait and see.. :) It is crazy how much discussion there can be on just one animal! Just shows how vast CoE is that we can talk so much about it. Outstanding! Can't wait to see it and more especially with this spatial os! Thanks. If i missed the kickstarter, when the store goes live, can i buy a "pledge" and gain the same benefits of that backer tier just like if someone who owned a pledge upgraded to the same one i just bought? when they add the paypal store you will have a 30 day window to buy pledges at the kickstarter backer levels. Posted By **Taiashi** at 7:07 AM - Thu Aug 04 2016 > > Okay so possibly a noob question here, > > If i missed the kickstarter, when the store goes live, > can i buy a "pledge" and gain the same benefits of that backer tier just like if someone who owned a pledge upgraded to the same one i just bought? > > or am i just screwed cause i missed the kickstarter by like 3 days? cause i really want to do the 350 tier when they add the paypal store you will have a 30 day window to buy pledges at the kickstarter backer levels. Will they email me when it happens. I only check this place like once every few weeks. No you will need to check back daily for when it goes live. I've been thinking about what the Ursaphant will be best at doing. You'd think it would be a nice mount to have, but it seems quite expensive to have and maintain (If you will need to keep mounts maintained). If you have a lot of land, you could use it as a type of plow, but this seems like Ursaphants will function a lot like war elephants. Very excited to see people potentially riding into battle on these beasts, they look absolutely wonderful and I can't wait to encounter one. I've been thinking about what the Ursaphant will be best at doing. You'd think it would be a nice mount to have, but it seems quite expensive to have and maintain (If you will need to keep mounts maintained). If you have a lot of land, you could use it as a type of plow, but this seems like Ursaphants will function a lot like war elephants. Very excited to see people potentially riding into battle on these beasts, they look absolutely wonderful and I can't wait to encounter one. You can still upgrade your pledge once the store is implemented..
Loving the short, sharp and sweet answer! Posted By **Caspian** at 6:26 PM - Thu Aug 04 2016 > > There is husbandry. And welcome to the community. :-) Loving the short, sharp and sweet answer! I've been drooling over this game since i found out about it, KEEP UP THE GOOD WORK GUYS!! I think this is a perfect update. Great job revising things! It is FAR easier to communicate what you have accomplished than to keep saying "We're working on x feature!" over several updates. The conclusion is great; it reminds us that you're working on a new, better way of communicating progress and it helps excite people about what is to come. I think this is a perfect update. Great job revising things! It is FAR easier to communicate what you have accomplished than to keep saying "We're working on x feature!" over several updates. The conclusion is great; it reminds us that you're working on a new, better way of communicating progress and it helps excite people about what is to come. Love the improved communication! I'm happy to see that the positions are open now and you guys finally got a web dev starting to work on stuff. Excited to see what's coming in the next few months! I see,yes. I can see a large amount. A very large amount. Of something green. Thin and like paper. A symbol. No four symbols. Letters. An S. An U. No. No. It's a V. And a P and a G.
So, you will be receiving a greater wealth shortly, but be warned, it won't make you rich just yet. Good crystal balls costs a fortune, my friend, and glass breakage insurance is killing me, all the while I have a many mouths to feed and must pay tribute to the gods of time. So please, be generous. What goes around comes around, after all. Will these Ursaphants be wild or domesticated ? If they are are wild can they be hunted for food and fur ? If they are domesticated what other purpose will they serve other than transportation of goods and production of manure ? They are both wild and domesticated. That's awesome  so now I can finally play a game I always dreamt of. A game where possibilities are endless and I no longer will be bound by the linear and redundant scripted events of the game. I am freeeeeeee. I will say that the Ursaphant looks... Well, interesting, but I'm sure it will serve a good purpose in-game. aww I don't mind when you talk about goals you haven't met yet. I think you're vision is very interesting. If the intensity of politics going on this far from release is any indication of what the game will be like then it is going to be frakkin AMAZING!! That Ursaphant looks like it's ben rendered on UnrealEngine. nice. Chronicles of Elyria uses UE4 for the client. I like the way the Ursaphant looks. I see you can mount it too, that's great! The Ursaphant looks great! Amazing graphics! Could the new web dev come up with a ballpark timeframe for the store for us? Uriel and Lazero if you don't shoot for the starts you will never learn to fly. I does seem over ambitious but I would rather them proceed with their vision and, if they have to, make changes and more goals after launch. If your friends don't want an ambitious game I am sure there are plenty of WoW clones out there from which to choose. As far as a Alpha channel, I would assume that will come during the Alpha phase of development. Since we are still waiting for the EU sqad to get a crack at donating through the WebStore (when it goes live) I would assume it would be after the store goes up, after the EU get their donations and tiers figured out, and after the Donation Survey comes out and gets processed. As far exact dates and times, I have no clue about those. Uriel and Lazero if you don't shoot for the starts you will never learn to fly. I does seem over ambitious but I would rather them proceed with their vision and, if they have to, make changes and more goals after launch. If your friends don't want an ambitious game I am sure there are plenty of WoW clones out there from which to choose. As far as a Alpha channel, I would assume that will come during the Alpha phase of development. Since we are still waiting for the EU sqad to get a crack at donating through the WebStore (when it goes live) I would assume it would be after the store goes up, after the EU get their donations and tiers figured out, and after the Donation Survey comes out and gets processed. As far exact dates and times, I have no clue about those. Love the update, however I don't see the Alpha 1 forums anywhere and as a count I know I have access to it, wherever it is. Early Access forum is not up yet. ETA later this week. Oh, we got a time frame? When i mention this game to friends, trying to get them interested the best i get is "they are way to over ambitious" and stuff... its sad how quickly people shy away from new things... this game as potential and i believe they will live up to it really well <3. Yeah I know... Sadly this happened for my friends as well when I where explaining about all the cool features =/ And ofc some of them are just blindly refusing to put any effort looking into CoE. I guess it does not matter as I will most likely get lots of new friends with the same interests as me when the game releases. =) I am so hyped!! I have seriously never been this hype about a mmo since archage. And we all know how that went.... I have faith that this game would be a ground breaking game and it will set a new meta for up coming games. IM SO READY FOR CHRONICLES OF ELRYIA.